For a limited time, you have FREE access to the Self-Assessment Quiz. • The online course material is divided into seven lessons along with a glossary and interactive self-assessment quiz (40 questions). • This course will help you focus on the terms, concepts and procedures you specifically need to know to serve competently in your new public and professional role. This class helps you prepare for your day-to-day duties as a New Jersey Notary Public and provides you with a comprehensive view of the notary public office. Confusing laws, concepts and procedures are clearly explained, and examples are given to illustrate situations that a notary is likely to encounter. Topics include avoiding conflicts of interest, maintaining professional ethics, charging proper fees, when to defer to an attorney and minimizing legal liability. Learn how to properly execute acknowledgments and affidavits, and how to administer oaths and affirmations, as well as inform yourself about what you cannot do as a notary within the State of New Jersey, such as performing marriages or certifying copies of official records. An orientation course such as this one is a must for notary candidates to become fully aware of the authority, duties, and responsibilities relating to this important public office. We believe we have the best online course materials and live instructor support (via email, phone or Skype to answer your questions) available to New Jersey notary candidates! The online course material is essentially the same as what is given at our 3-hour live program. The language is plain English, the course outline is clearly structured, and our online viewer is a breeze to navigate. The New Jersey-specific details are fully up-to-date. If you're looking for the New York edition of the course instead, click here. While a seat at our live program runs from $75 to $100, the online version is only $39. "O.K.," you might say, "That sounds fine — I will save money by taking the class online, even though I would prefer live classroom interaction. But how much are the mandatory State fees that I must pay to become a notary?" Answer: Whether you choose a live classroom session or the online version from providers like us, your official filing fees are minimal. There is a $25 fee payable to the N.J. State Treasurer, along with a $15 fee payable to your County Clerk when you get sworn in. Your New Jersey notary commission, i.e. license, will be good for FIVE years. We point you to sources of notary supplies, such as stamps, and services such as Notary Public Errors & Omissions Insurance, without "pushing" any products in particular. We give you straight talk about which product lines are preferred. You'll appreciate the practical, hands-on, "no-nonsense" teaching style. The online course was launched on October 1, 2011. 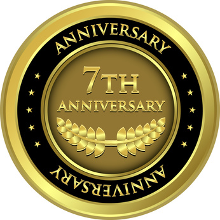 We are now celebrating the website's seventh anniversary, and my ninth year of teaching the course to groups. You might be interested to know that the lessons are updated on an ongoing basis, in real time, to keep pace with changing laws, clarify application procedures and address frequently asked questions. Therefore, our materials are more up-to-date than anything you are likely to encounter in traditional formats such as printed textbooks. Exciting new developments are underway in New Jersey with the approval of Assembly Bill 1423 / Senate Bill 2043 on September 10, 2014 as well as the ongoing discussion of the Revised Uniform Law on Notarial Acts / N.J. Notaries Public Act — the first major consolidated set of revisions to the rules and regulations governing notaries since the N.J. Notary Public Act of 1979. The proposed rules would require a 3-hour course of study along with a passing grade on a written examination for your initial 5-year commission (i.e., license). Two hours of continuing education would be required for commission renewals. However, these changes are coming slowly. For the time being, the old system still remains in effect. Neither a written examination nor any specific coursework is required for eligibility. As a result, there is some confusion — New Jersey notary candidates find themselves at a disadvantage when it comes to preparing for their actual day-to-day duties and functions in 2019 and beyond. Many recommended reading lists are, quite frankly, outdated. Publishers are waiting for the other shoe to drop in Trenton before releasing new study guides. Meanwhile, there is a persistent need for quality seminars. Our seminar provides orientation and peace of mind for first-time New Jersey notary public candidates as well as current notaries who are looking for an update and refresher course. The seven lessons are very comprehensive. You'll learn the basics to help minimize legal liability and succeed in the performance of your official duties. The overall learning experience of our N.J. Notary Public Online Seminar is as personalized as you would like it to be. Please free to contact me at any time. My telephone number is provided to you upon enrolling in the course. I'm also happy to communicate via email and Skype. Once you have taken the live program or the online course, or both, and if you would like to share your comments, we want to hear from you. We enjoy hearing the success stories of candidates who, with a little help from us, have gone forth to become confident, competent, duly commissioned notaries. Please email feedback@NotaryEd.Com. Thank you!